This blog is updated by passionate celebrants. Make sure you subscribe so you don't miss the latest from Civil Celebrations Network - CCN. More CCN Blog posts can be found in the Blog Categories to the right. Couples who are being married by a civil marriage celebrant can be confident because their celebrant operates under the Code of Practice for Marriage Celebrants. So, what can you expect from your celebrant? (c) accuracy in preparation of documents and in the conduct of marriage ceremonies. (c) avoid unlawful discrimination in the provision of marriage celebrancy services. 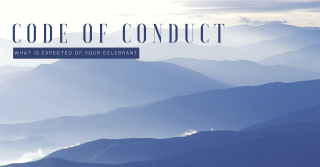 (c) giving the parties information about how to notify the Commonwealth Attorney-General’s Department of any concerns or complaints they may have regarding the marriage services provided by the marriage celebrant. (b) inform the parties to the marriage about the range of information and services available to them to enhance, and sustain them throughout, their relationship.